Your holiday experience will begin from Lord & Taylor on 5th Ave where guests will meet their guide and walk to the Holiday Market at Bryant Park to check out local foods, handmade jewelry, and more. After everyone has regrouped, your tour guide will take you to the amazing neighborhood of Dyker Heights in Brooklyn on our state of the art warm vehicle to see some of the most fantastic holiday decorated homes around! While in Dyker Heights guests will be getting off the vehicle to walk through the neighborhood’s street and get amazing views of these iconic home’s decorations. When back in Manhattan guests will then be able to get off the vehicle and view a transformed Macy’s. Your tour will then end behind Rockefeller Center just a short walk to the most famous Christmas Tree in NYC! This famous tree, towering above you, will make for a wonderful photo opportunity to show your friends. This Christmas Lights Tour is the ultimate way to see the lights and wonders of Manhattan during the holiday season while staying warm and cozy in our luxury vehicles. Throughout the tour you will also be getting in a out of the vehicle with your guide, so dress accordingly, to see the lights up close and have time to make everyone back home jealous with the amazing photos you will get! Your holiday experience will begin from Lord & Taylor on 5th Ave where guests will meet their guide and walk to the Holiday Market at Bryant Park and check out local foods, handmade jewelry, and more. After everyone has regrouped, your tour guide will take you to the amazing neighborhood of Dyker Heights in Brooklyn on our state of the art warm vehicle to see some of the most fantastic holiday decorated homes around! While in Dyker Heights guests will be getting off the vehicle to walk through the neighborhood’s street and get amazing views of these iconic home’s decorations. When back in Manhattan guests will then be able to get off the vehicle and view a transformed Macy’s. 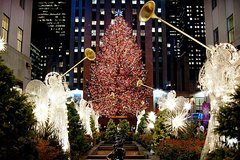 Your tour will then end behind Rockefeller Center for a short walk to the most famous Christmas Tree in NYC! This famous tree, towering above you, will make for a wonderful photo opportunity to show your friends. Throughout this entire tour a licensed tour guide will provide info about the wonders around you and answer any questions you have. Macy’s, Dyker Heights Brooklyn, Bryant Park, Rockefeller Center, and more! A wide variety of window displays along 5th Ave, Macy’s window displays, Dyker Heights Brooklyn, the numerous shops at Bryant Park, the ice skating rink at Bryant Park, Rockefeller Center, the famous Rockefeller Center Christmas Tree, and more!